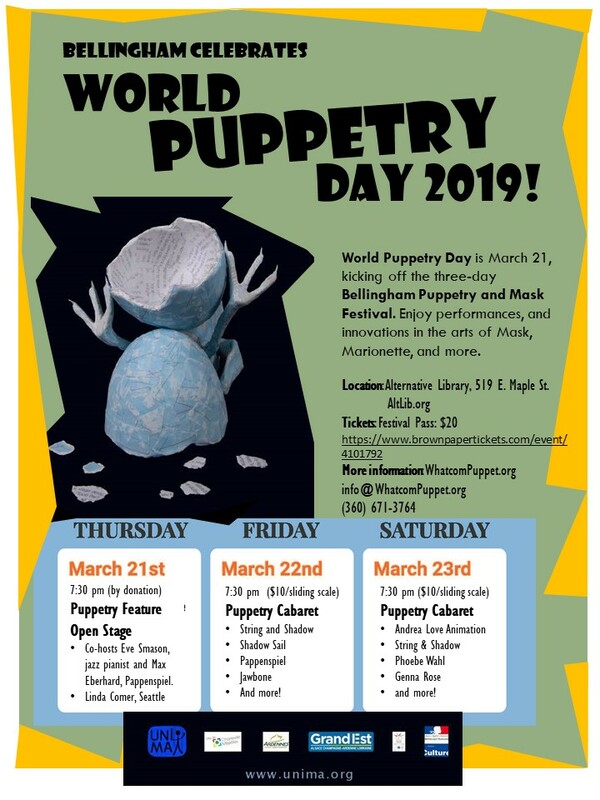 Bellingham, Washington (USA) is celebrating World Puppetry Day 2019 with a mini‐festival from March 21st through March 23rd. The festival includes a line‐up of local and regional performers in a variety of marionette, mask, string, shadow and stick puppetry media. Most performances take place at the Alternative Library at 519 East Maple Street in downtown Bellingham. The festival begins on Thursday, March 21, at 7:30 pm with an Open Stage event co‐hosted by Eve Smason, jazz pianist, and Max Eberhard, local puppeteer of “PappenSpiel” fame. Seattle performers “Jawbone Puppet Theatre,” and Linda Comer will entertain, followed by interactive audience engagement opportunities and short sketches. Learn how puppets are made, operated, and more. The Festival continues on Friday and Saturday evenings with a Puppetry Cabaret featuring performers from Olympia, Portland, Seattle, and Bellingham. Performances start at 7:30 pm. Friday’s show features String and Shadow Puppet Theatre of Olympia. They’ll tell how “Esperus: The Janitor” saves the old world. Pappenspiel will perform followed by Shadow Sail puppet theatre, bringing Noodle back to the stage, along with Jawbone Puppet’s Adam Ende from Seattle. Saturday’s show features author GennaRose with a folktale of mythical and magical revelations illustrated with art on a “crankie” scroll . Winner of the 2017 National Poetry Series competition. Local author Pheobe Wahl, String and Shadow, Andrea Love, and more will round out the cabaret. It is hoped that the Bellingham World Puppetry Day festival will be the founding event for formation of a Whatcom Puppetry Guild composed of local performers and artists. Some topics presented in the festival shows may not be suitable for young children. For up‐to‐date performance and festival details, visit WhatcomPuppet.org or call (360) 671‐3764 or email info@WhatcomPuppet.org.